Guest editor Chad Kessler has assembled an expert panel of authors on the topic of Alterations of Consciousness. 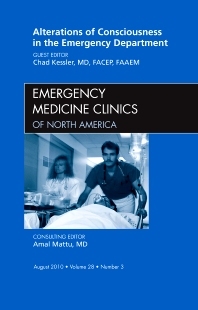 Articles include: The Mental Status Examination in Emergency Practice, Dizzy and Confused: A Step-by-Step Evaluation of the Clinician’s Favorite Chief Complaint, Diagnosis and Evaluation of Syncope in the Emergency Department, The Emergency Department Approach to Syncope: Evidence-based Guidelines and Prediction Rules, Pediatric Syncope: Cases from the Emergency Department, Seizures as a Cause of Altered Mental Status, Central Nervous System Infections as a Cause of an Altered Mental Status? What is the Pathogen Growing in Your Central Nervous System?, Traumatic Alterations in Consciousness: Traumatic Brain Injury, and more!